I’ve been wearing glasses since the age of 11 – back then and throughout my teens, glasses were a correctional aid for those with rubbish vision and came with many a ‘speccy four-eyes’ taunt. They definitely weren’t a fashion statement. It’s been interesting (and also, kinda frustrating) to see the perception of specs change over the years. 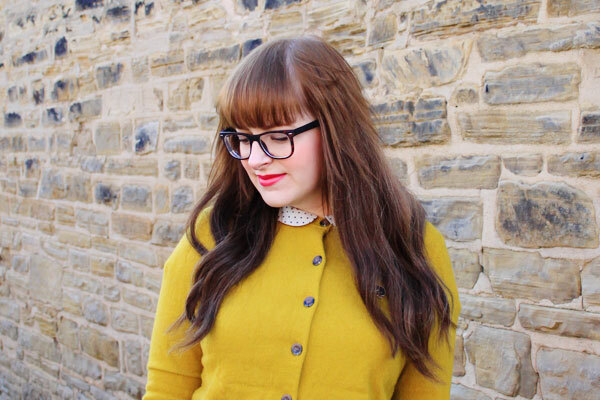 I’ve always loved wearing glasses – I wanted a pair of pink My Little Pony frames back when I had 20:20 vision – and although I favour bold frames, the transition from simple sight-givers to style staples has been a little odd. I’m quite good at spotting fake specs (with plain lenses rather than prescription ones) and like to indulge a moment of indignation – I wear glasses because my eyes are deteriorating. I’m a true spectacle-wearer. This train of thought often ends in a serious dose of side eye (from weakened, slightly squinted eyes, granted) and a flounce in the opposite direction. Despite often being asked if my glasses are ‘real’ (which I answer by taking them off and doing my ‘who said that?’ routine), the ‘geek chic’ trend has been kind to us genuine four-eyes. Wearing a bold, oversize frame like the Anson, sent to me by Swag & Stare, generates the kind of nerdy appeal usually reserved for Silicon Valley rockstars and hipsters with beards. No longer are you the red-faced teen with gawky glasses – you’re officially cool, my friend. The Anson frame is made with Flexpex, making it SO much lighter than other frames in this style. 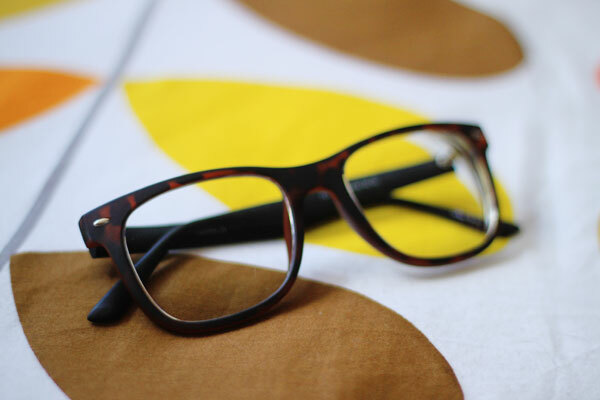 I felt a noticeable difference in weight when I slipped these on compared to some of my other specs – great if you wear glasses full-time and want to lighten your load. 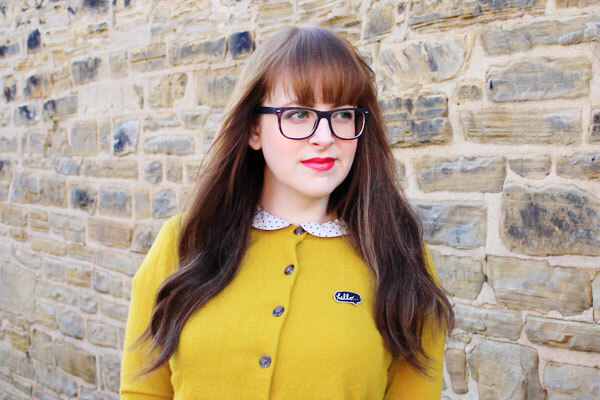 In keeping with my dork-adore vibe, I teamed my geeky glasses with a cardigan, Peter Pan collar, a speech bubble brooch and some tasseled brogues. To balance out the Amy-from-Big-Bang-Theory factor, I added tough skinny jeans and a poppin’ pink lipstick. Corduroy not included. What are your thoughts on the specs-as-accessories trend? And how would you style these statement frames? 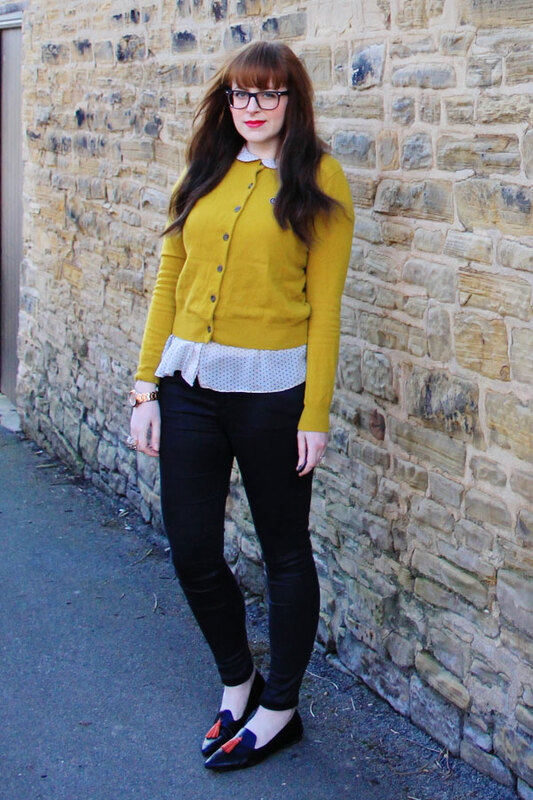 Love the colour of your cardigan! Being a glasses wearer myself as i have been since the age of 6 it frustrates me greatly when people ‘pretend’ to wear glasses. WHY? WHY WOULD YOU DO THAT? As much as I’ve learnt to love my specs i wish i didn’t have to wear them so when someone who doesn’t need to wear them, wears them, i’m sorry but you my friend are an idiot. I’ve worn glasses since I was 12 and the fake glasses trend drives me mad! I had to suffer with speccy four eyes taunts for years and now they’re all wearing fake ones. I love wearing glasses but I also love my contact lenses. This actually made me laugh out loud! I too have been wearing glasses since a young age (5 years old, they were pink and yellow) and I absolutely hated wearing them. As much as I too have learnt to love my glasses, I wish I didn’t have to wear them so I don’t understand the appeal of wearing them if you don’t need them. I love those glasses on you. And totally smitten with those flats! I’d love to be able to pull of the larger framed glasses, but I can never find a style that suit me. I have to stick to smaller frames. I’d never wear contact lenses. Having glasses is a great way to accessorise…. So many different colours and styles to choose from out there! I really love those glasses and the yellow sutis you so well! I’ve always wanted glasses. I know that’s really daft, and I don’t *quite* need them yet, but I’m sort of excited for when I do..
Hilariously, this reminds me of how I used to feel about contact-lens wearers. As someone with perfect vision, I used to moan that wearing contacts was “cheating.” I was quite obnoxious in my younger days, apparently. I suppose it comes down to the primal urge to find someone with good genes, so by wearing contacts you’re giving a false impression of having some top-quality eyesight genes to pass on to any future sprogs, or something? I don’t even know. It made sense in my head at the time. Of course, I’ve ended up marrying someone who’s practically blind, his eyes are so bad. AND HE WEARS CONTACTS – POINT PROVEN. But I’ve also since realised that kids with glasses are in fact the cutest ever, and now that glasses are firmly back in style… maybe I picked the right genes after all? Mine arrived on Monday and are suspiciously simular to these, aand I adore them! I’m so jealous you pull off glasses and a full fringe. Something I just can’t get away with. I’ve had glasses since I was three. And for many, many years I didn’t understand why all my friends were so fascinated by my glasses and loved the novelty of trying them on and pretending to be a specky four eyes for a few minutes. 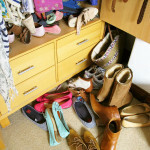 I used to find them such a chore to wear and hated the way that I felt I was stuck hiding behind them. I’ve had contacts since I was about 16 but I think it’s been a bit of a boost in a roundabout way that glasses have become a statement and quite cool now. I’ve fully embraced it with a pair of ray bans which I now love wearing, but I still hate seeing people with clear lenses and fake specs… If I had the choice I’d choose perfect vision but since its not an option I quite enjoy being part of the exclusive little club that gets to legitimately wear cool glasses. At the end of the day, they’re not an accessory, they’re a necessity. But yes, I completely agree. It really irks me when people wear glasses who don’t need them to see. I am completely blind without mine… a face a mere metre away from me without my glasses is just a blur. I find it kind of obnoxious and of course, totally fake. HOWEVER… as a child that had to wear glasses at school, my life would have been much easier had glasses been ‘cool’. So I guess, why does it matter? I also hate it when people think its ok to tear the glasses off of your face to try them on…but that’s another rant altogether! You look lovely! UGH. People that take glasses off your face are the WORST. And it’s ALWAYS followed by, “Woah, how do you see in these? !” GRR. I have been wearing reading glasses for some time now and it’s getting apparent that I will soon need glasses for distance too. The Anson oversize frames would be perfect for that, as they would allow for great vision for driving, look great, and be distinct from my reading glasses with have much more delicate frames (cheap ones from the pharmacy). 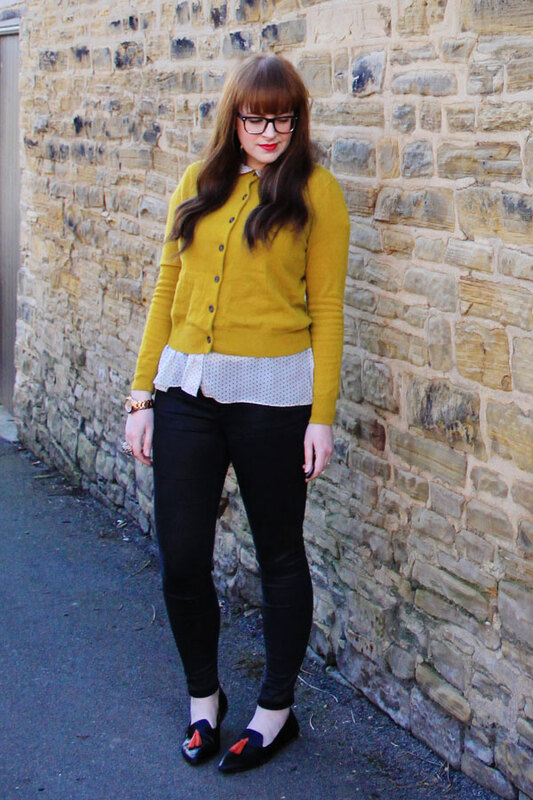 I love the look of your yellow Cos cardigan with the Peter Pan collar of your Topshop blouse. The Anson frames would go well your outfit. I think you could style them with almost any OOTD and have a pretty result. You are adorable and that color looks great on you! 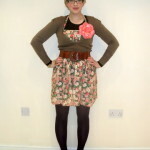 Hey Jen, I love your outfits!! 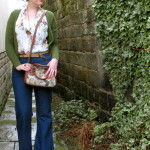 and with your blog, because they are stylish, quirky and (so my customers say) very good value for money!! I have astigmatism and am short-sighted, worn glasses for as long as I can remember. It annoys me a bit. Like, I don’t bob around town with a lovely pair of fake designer crutches on a night out for a super cute photo op. On the other hand, my little boy will almost certainly wear glasses from a young age. Anything that’ll mean he’s less likely to be bullied or thought of as “different” is a-okay. They’re beautiful frames! They really suit you! Loving the specs! I definitely think the statement frame should stick around for a while – it definitely suits you. Sadly the geek chic trend has yet to make my glasses-wearing cool. My frames in themselves are “trendy” (as my mum would say), but having to get them out to read stuff is still only something nans should do. Curse my long-sightedness! Haha I bet those teasers feel dumb now! But I totally know what you mean I’m kind of jealous people get to just ‘wear’ the trend rather than needing it, especially when people say it’s only cool when they’re not needed! WHatever those specs are gorgeous and suit you so well! You look so glamorous with eye catching yellow. So sweet. I love this colour and its perfectly matching with you. I’ve worn glasses for years and love having different frames to mix and match with different outfits. They are absolutely a fashion accessory, I can see why people with good eyesight try to get in on it too! I tend to find the frames I like on the high street and then see if I can find the same ones cheaper online, Glassesdirect.co.uk normally have a good selection if you don’t mind waiting for them to be delivered.